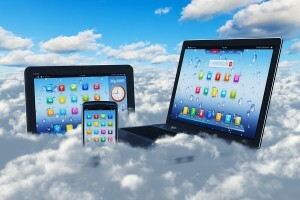 Cloud storage is gaining popularity every business quarter. There’s a lot of ways to store your documents, from a filing cabinet in your office to an offsite document storage facility. Depending on the systems and procedures you currently have in your document management plan, scanning your documents and moving to the cloud may be an attractive option. Let’s take a look at some of the reasons businesses are migrating from paper documents to utilizing cloud document management systems. One of the most expensive parts of running a business is the computer hardware and IT support it takes to install and maintain your systems. A cloud service is an affordable way to install a centralized network to share files and back up your system. It’s also cost-effective way to back up large amounts of data instead of buying an expensive network server dedicated solely to data storage- and the company or labor to maintain it. Cloud services allow a company to subscribe to an online service for a nominal fee for the entire business or per user. Cost is variable depending on the capacity and the requirements that your business requires, but the per-user cost is usually much more cost-effective than a server that is thousands of dollars. You have access to files on the cloud as long as you have Internet access. The files stored on the server are not device-oriented- your employees can access files on their smartphone, notebook, tablet, laptop or any Internet-enabled electronic device. This makes virtual commutes easy, and allows people to have more freedom to connect with clients and their family no matter where they are. When you use the cloud for you’re business, you don’t have limitations on the number of users you can add. This may not be the case when it comes to old-school network infrastructure. Although there might be a per-user cost to add new employees to the service, it usually is a lot cheaper than the IT support to add a user to your existing network alone. In addition to user flexibility, you also have the ability to add capacity for a minimal price increase. Adding email addresses, online storage, file sharing and more is not only cost effective, it’s usually easy to implement. There’s no more 5 day waiting period for IT to get your new employee access to their emails. Security is one of the biggest questions that people have about cloud services. Is it really as secure as the cloud service management companies say they are? Well, it’s hard to say that any system is 100% secure. There’s steps you can take to protect your business when you use cloud services. All cloud services are protected by powerful encryption from the second you sign into the system. All your documents should be protected when you transfer them, access them, and even when you download them. You also have the ability to grant clearance levels depending on the confidentiality of the documents in your system. That way, you can eliminate the risk of unauthorized personnel accessing documents they shouldn’t be. Barring a power outage or natural disaster where your servers are located, your cloud service is almost always available. Your data is backed up nightly through an online solution through an Internet connection rather than someone having to transfer physical tapes or disks to an offsite location. The data is mirrored at multiple data centers to further guarantee the integrity of the data so that it is very difficult to have a catastrophic or complete data loss. In essence, your data is backed up, stored off-site, easy to access, and very rarely unavailable. Overall, cloud document services are here to stay, and are becoming mainstream in document management. The more you understand it, the more trust you’ll put in it. If you have any questions, Record Nations can help! We will connect you with cloud storage professionals that can walk you through the tedious process of selecting a cloud storage company. Fill out the form to the right, or give us a call today at (866) 385-3706 or for a free, no-obligations consultation on your cloud storage needs.